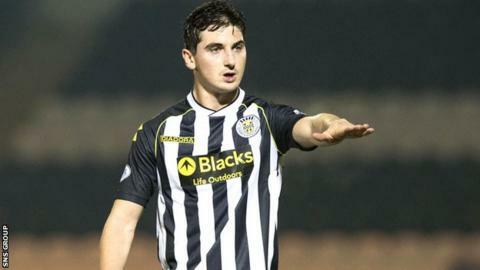 Midfielder Kenny McLean may need to leave St Mirren to progress his career, concedes chairman Stewart Gilmour. The 22-year-old is out of contract this summer, having made his Buddies debut in October 2010. "We made Kenny a very good offer; the best offer St Mirren can make," Gilmour told BBC Radio Scotland. "I think for Kenny's development, yes it's probably time for him to move down south. Sometimes a player just comes to the point when it's time to move." St Mirren will be due a compensation fee for McLean since he has come through the youth ranks at the Paisley club. "He's a great lad and I've got a lot of respect for him," explained Gilmour. "I'll be delighted if he gets a good club. It's all part of the process of developing kids. "If he doesn't, Kenny knows very well that he has been offered a super contract and he'll be more than welcome playing for St Mirren next season." McLean, capped nine times for Scotland Under-21s, has been linked with Rangers as well as a long list of English sides. "Kenny has handled all of this very well," said Gilmour. "He's been very professional. "I hope Kenny does well from this and that St Mirren also do well."